"Ethel, how could you ever think up a sneaky scheme like that. Who do you think you are�me?" Who doesn't love Lucy? It's true, America's affection for that delightfully scatterbrained redhead may vary by degree, but there are few among us who haven't at some point guffawed at her TV antics. While women's roles in marriage, society and the workplace have drastically changed in the fifty years since I Love Lucy premiered on CBS-TV, our reverence for its star has not. Whether she's scheming with gal pal Ethel (Vivian Vance) or embroiled in a self-imposed comic disaster, Lucy is locked in a timeless time capsule. The situations she faces may be prehistoric by today's standards, but the themes and Lucy's matchless physical humor still provoke that bottom-line, visceral response�laughter. Fourteen years after her death, Lucy remains a national treasure, and will no doubt gain new fans through the release of I Love Lucy episodes on DVD. 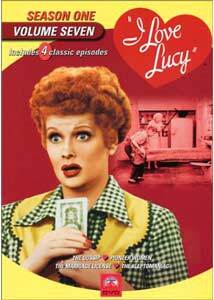 My young kids hadn't the faintest clue who Lucille Ball was, yet they found the four episodes included on this seventh volume of I Love Lucy's inaugural season amusing and engaging. As with any TV series, episode quality varies; some are sparkling, others routine. But one can always count on a high degree of energy and enthusiasm from the show's comedic quartet. They're not only performing, they're working, and today's audiences still respect the sweat that produces the laughs. Of course, Ball, Desi Arnaz, Vance and William Frawley can't (and never did) claim all the credit for the show's staggering success. The writers (in this case Jess Oppenheimer, Madelyn Pugh and Bob Carroll, Jr.) were masters at exploiting common human foibles. With an acute sense of comic conflict, they zero in on simple everyday issues and transform them into hurricanes of hilarity. Topics as mundane as balancing the checkbook, gossiping with friends or outsmarting one's spouse take on whole new dimensions as the sexes square off. While audiences howl at the slapstick humor of Lucy and Desi, they identify with the nuggets of truth buried beneath the gags. That hint of self-recognition was the hook that kept viewers returning week after week, and Lucy and company reveled in reeling America in. A half century later, no matter how many times we've seen the episodes or how familiar the dialogue and shtick may be, Lucy continues to reel us in. And these DVDs ensure we'll be loving Lucy for years to come. In this boys-against-the-girls episode, Ricky (Arnaz) is fed up with Lucy's incessant gossiping. Lucy and Ethel counter that men relish dishing the dirt as much as women, but Ricky and Fred (Frawley) view the situation differently. "The point is we can take it or leave it alone," Ricky says. "With you women, it's your life's blood." As the sparring escalates, Lucy and Ethel bet Ricky and Fred that the women can hold their tongues longer than the men, with the loser serving the winner breakfast in bed for a month. Of course, the men quickly conspire to sabotage Lucy and Ethel by pretending to talk in their sleep and transmitting a piece of irresistibly juicy gossip. The girls take the bait, but ultimately enjoy the last laugh in this clever and amusing battle of the sexes. The episode allows Lucy to show off her terrific mime skills, as she's forced to act out a lengthy bit of gossip in order to pass it on to Ethel. Top-notch ensemble work snares this episode 4 out of 5 hearts. When Lucy and Ethel demand that their husbands buy them electric dishwashers, Ricky and Fred retaliate by calling them spoiled, pampered housewives who wither in the face of real work. After all, they say, pioneer women lacked all modern conveniences and they never complained. When Ricky challenges the girls to live without electrical aid for a few days, they wonder if the boys could handle the hardship, too. "We're men. We're rugged," Ricky sneers. The couples agree to test their endurance, with fifty dollars going to the pair that lasts the longest. Complications ensue when the Society Matrons' League (to which Lucy and Ethel have applied) drops by for a surprise inspection to examine how the Ricardos really live. The episode contains a classic sequence that chronicles Lucy's attempt to bake homemade bread. She misreads the recipe and adds quadruple the amount of yeast, resulting in a monstrous loaf that literally bursts out of the oven. Terrific physical comedy from Lucy and Ethel lifts this episode to 4 hearts. While cleaning out the living room desk, Lucy happens upon her marriage license and discovers a glaring typographical error. Instead of Mrs. Ricky Ricardo, Lucy shudders at the notion that she's actually Mrs. Ricky Bicardi! "For all I know I might be married to a rum factory," Lucy wails. Believing her marriage might be fraudulent, a devastated Lucy demands she and Ricky remarry, but with a whopper of a condition: they must replicate the proposal and subsequent elopement exactly as it happened a decade earlier. Ricky half-heartedly appeases her, trekking up to Connecticut to find the same park bench where he popped the question. His lack of enthusiasm and joking attitude, however, prompts Lucy to rethink her decision to marry him at all. This episode enjoys a lofty reputation, but I found it more dated than those focusing on more plausible and timeless domestic topics. Lucy and Desi shine in their courtship scenes, but guest star Irving Bacon steals the show as a hotel clerk who gives new meaning to the term "a man of many hats." Also notable, Elizabeth Patterson, the future Ricardo neighbor Mrs. Trumbull, makes her debut on the program as Bacon's wife. Although I'm usually a sucker for romance, I'll have to give this episode 3.5 hearts. Due to a mishap at the Women's Club Fourth of July party, Lucy wants to keep her involvement in the club's upcoming auction secret from Ricky. But when Ricky finds a wad of cash in Lucy's purse (meant for renting a hall and hiring a caterer), he becomes suspicious of its source. Flustered, Lucy admits to stealing the money. At first, Ricky thinks she's fooling, but when he catches her hiding antiques (meant for auction) in their closet, he worries she's a kleptomaniac. He plans to bring home a psychiatrist to evaluate her, but Lucy gets wind of the impending visit and decides to play the role of thief to the hilt. With Ethel's help, they turn themselves into the machine gun toting "Lucy the Lip" and "Baby Face Ethel." Some cute moments liven up this episode, but the finale goes overboard, straining credibility far beyond the sitcom norm. Joseph Kearns, best known as Mr. Wilson on Dennis the Menace, guest stars as the befuddled doctor. Sometimes even Lucy goes too far, bumping this episode down to 3 hearts. Image Transfer Review: One of the smartest and most innovative decisions Desi Arnaz ever made was to film I Love Lucy rather than produce it live. The resulting print provided much higher image quality than the customary kinescopes of the day (and eventually made millions for Lucy and Desi when the show pioneered the practice of syndication). Such foresight has enabled Lucy to be spotlessly transferred to DVD, with the episodes looking better than many Hollywood movies from the same period. The only distracting element is some shimmering that occurs on heavily patterned suit jackets, dresses and upholstery, which adds annoying flashes of color to the black & white image. (Turning the color off on your set will alleviate this issue somewhat.) Contrast, detail and depth levels are all strong, and while occasional grit can be detected, you really have to possess an eagle eye to catch it. Audio Transfer Review: The voices sound a bit shrill, but dialogue is always clear, and Ricky's English slurs are more delightfully evident on this mono track than they were on the old reruns. Extras Review: The disc features the same line-up of extras as the other volumes in the series, and while not extensive, some noteworthy clips, information, and trivia are included. An installment from Lucy's popular radio show, My Favorite Husband, provides the inspiration for The Marriage License episode. Penned by the same writers who crafted the TV version, this initial run-through pales by comparison, but astute listeners will notice that snatches of dialogue are repeated verbatim on I Love Lucy. While Lucy's acerbic tones add spice to her line readings, one can quickly understand why she achieved greater success on TV, which showcases her physical talent and completes her comedy package. Still, this full-length episode is enjoyable, presenting a more subdued version of the Lucy Ricardo character. A couple of minor flubs from two shows don't add much, but satisfy the current appetite for outtakes. The disc also includes the original (and much weaker) opening title sequence for the series�apparently the satin heart only debuted when the show hit syndication�and restores some music cues that were deleted and redone for the resale market. Production notes offer trivial tidbits pertaining to each episode, such as the supplier of the mammoth bread loaf for the Pioneer Women show and how Lucy argued with the director over some blocking moves in The Gossip. The most fascinating extra just might be the guest cast bios for each episode. I Love Lucy always featured top-notch supporting players, many of whom appeared multiple times and in multiple roles on the series. The included bios connect all the dots, fleshing out the careers of these very familiar faces. The producers of this DVD series deserve kudos for recognizing the enormous contribution these bit players made to the show and for supplying such extensive information about them. None of the four episodes included in this collection are bona fide classics, but all remind us why we love Lucy and her gang. So symbiotic is the relationship between Ball, Arnaz, Vance and Frawley, they could easily be called the original Fab Four. While only diehard fans of the series might want to purchase this volume, it provides a welcome dose of comedy and nostalgia for the whole family.